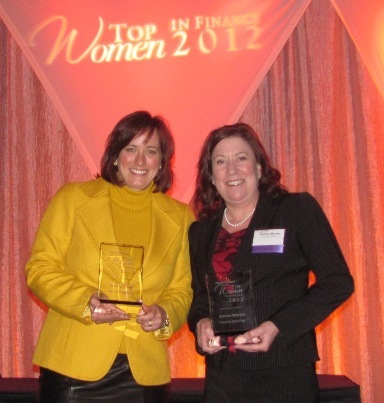 Mickey Webb, Chief Operating Officer (COO) at Associated Financial Group (AFG) and Karen Martin, Commercial Real Estate (CRE) Relationship Manager were recently recognized by the Finance & Commerce newspaper as two of the Top 50 Women in Finance in Minnesota for making notable contributions to their professions, their communities and society. Webb began her career at Associated Financial Group (AFG) in 1997 as the Accounting Manager. Her willingness and determination have helped her rise to be the COO at AFG. Webb has many supporters at AFG because she is an extraordinary leader who has helped many colleagues develop their careers. “I believe that everyone should be given the opportunity to do what they do best and enjoy doing the most,” said Webb. Her colleagues describe her as a trusted advisor and exceptional mentor with a great sense of humor and an ability to make you feel that any goal worth setting is attainable. “Mickey has helped create a great culture at Associated, and I feel very blessed to be able to say I truly love and enjoy working here,” said Ragan Cheney, HR Consultant at Associated. “She serves as a great role model for other female leaders. She is supportive, yet challenges each of us to see past a problem to the solutions and inspires great confidence in all of us,” said Cheney. Visit Finance & Commerce to read Mickey’s story. Martin started her banking career 20 years ago as a credit analyst at a different bank. Today Martin manages a portfolio of over $130 million of commercial real estate loans concentrated in construction and term facilities secured by multi-family, retail, industrial and office properties. Complex credit analysis motivates Martin to be creative when structuring deals. Her credit skills led her career to the Commercial Real Estate department at Associated, where she works on complicated financing structures, including historic tax credits and tax-exempt bonds. Martin’s job keeps her busy. “I am responsible for new business development including loan production, fee generation and cross-sales among multiple business lines,” said Martin. Due to her broad experience, she has become a go-to resource for other Associated lenders working in the same industry. This is an impressive achievement due to the fact that the CRE world has historically been male dominated. “I am fortunate to work for a great organization such as Associated. The recognition byFinance & Commerce gives me even better motivation to work harder and achieve my goals,” said Martin. Visit Finance & Commerce to read Karen’s story.